Gastro Esophageal Reflux Disease: Is There a Cure? Gastro Esophageal Reflux Disease (GERD), also known as acid reflux, is a chronic, distressing and painful medical condition with a significantly negative impact on one's quality of life. Heartburn and regurgitation are typical symptoms of gastro esophageal reflux disease alongside chest pain, dry cough, indigestion, reactive airway disease, painful swallowing and the sensation of food stuck in the throat. In the long run, untreated GERD can lead to severe complications such as ulceration, Barrett's esophagus and even adenocarcinoma (a cancer that originates in glandular tissue). Gastro esophageal reflux disease is a common problem in developed western countries, especially in the United States, with approx. 60% of individuals experiencing symptoms associated with GERD at least once a month. A research by Locke, Talley and Fett, published in 1997 in the Gastroenterology journal, has found that acid reflux symptoms occur on a weekly basis among almost 20% of the individuals. Other studies have shown a prevalence of 30% to 40% in the general population. Gastro esophageal reflux disease is a medical condition with multifactorial etiology (triggered by several internal and external factors). Among GERD's direct contributing factors are: the weakening of the muscle called the lower esophageal sphincter, or LES causing the leakage of gastric juices from the digestive system back to the esophagus and over acidity in the stomach. In addition to these direct physiological factors, there are several underlying causes that provoke acid reflux condition. These include dietary factors, lifestyle related factors and genetic factors that directly or indirectly shape the environment in which GERD develops. For instance, certain foods have been known to weaken the LES and thus aggravate acid reflux. Unhealthy dietary patterns in general can stress and weaken the digestive system whose proper functioning prevents extra acidity and the retrograde flow of stomach contents. The aging process is another factor; in time the sagging of all body's muscles including the LES, contribute to the disruption of the esophagus' defense mechanism. Acid reflux treatments can be divided into three broad categories: surgical intervention, medication treatments and all natural holistic treatments. GERD surgery is aimed at tackling the impairment of the LES locally. The surgery is performed by wrapping parts of the stomach (i.e. gastric fundus ) around the lower esophagus in order to strengthen the natural valve between the stomach and the esophagus. This intervention prevents the refluxed stomach content to come into contact with the esophagus. Acid reflux surgery has significant downsides; postoperative side effects are common and include difficulty with belching, dysphagia, diarrhea and increased flatulence. Moreover, although mortality from antireflux surgery is low, death can occur in approximately one of 1,000 patients. GERD medications are focused at achieving temporary relief by tackling the digestive system impairments related to acid reflux. Antacids, for example, are aimed at neutralizing the acidity in the esophagus, while PPI (Proton pump inhibitors) block the mechanism in the stomach cells that releases acid into the stomach. 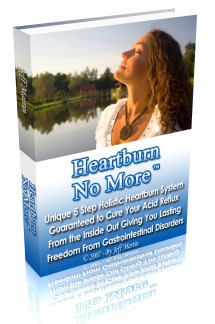 Unfortunately, most medications are merely aimed at tackling GERD's symptoms, while neglecting the underlying causes. This is why acid medications work temporarily and create long-term dependency, leaving the root causes of gastro esophageal reflux disease unrelated. There are also numerous side effects related to the long-term use of GERD medications. The vast majority of medical studies, published during the last decade, have shown that the combination of several holistic all natural protocols can have a positive impact on managing gastro esophageal reflux disease and even lead to complete recovery. These treatments include, among other means of intervention: elevating the head of the bed by six inches, decreasing fat intake, stopping smoking, reducing alcohol consumption, losing weight, detoxification and parasite eradication, and avoiding the consumption of large meals and certain types of food that weaken the LES. Did you know that there is a holistic all-natural treatment of gastro esophageal reflux disease that can effectively and safely stop and prevent Gastro Esophageal Reflux Disease and yield miraculous results over your health and well-being?